• Say goodbye: the vote to oust South Gippsland Shire Council was overwhelming, with all but a few dissenters. MINISTER for Local Government Adem Somyure said he has “requested advice from the Monitor and expects to receive a report next week” in the wake of a public vote to dismiss South Gippsland Shire Council. “I expect that Council will listen to the views of its residents and ratepayers,” the Minister told The Mirror. About 400 people gathered at the Leongatha’s Memorial Hall last Thursday, at the invitation of the Leongatha Business Association. Among those present were Member for Gippsland South Danny O’Brien, Member for Eastern Victoria Melina Bath, former councillors Maxine Kiel, Meg Edwards and Nigel Hutchinson-Brooks, and Cr’s Jim Fawcett and Lorraine Brunt (who have announced their resignations, effective from April 1). 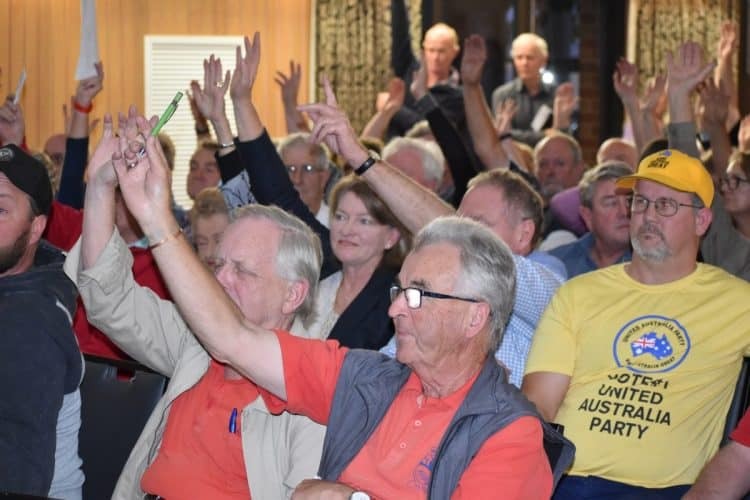 While some residents rejected the idea of a vote to oust Council, the overwhelming majority of those present were in favour of asking the Minister to make the move. Meanwhile, Cr Jim Fawcett said he will table a motion at the next Council meeting to help lift the lid on bullying behaviours. Cr Fawcett said he was not leaving because of a vote to advertise CEO Tim Tamlin’s position – as claimed by Mayor Cr Don Hill – but “the behaviour of councillors”. He said that “a lot of the behaviours occurred behind closed doors”, meaning specifics could not be aired in public. “What I will say to you is that at the next formal meeting of Council (Wednesday, March 27), we will be moving a motion to make public some of the confidential reports that have been sat on for months and months and months,” he said. The vote to dismiss Council was proposed by former Korumburra and South Gippsland Shire Council councillor Jim Forbes, who said “nothing will counteract the intimidation and the bullying that’s taking place”. Mr O’Brien said an act of parliament must be passed for council to be dismissed. Speaking at the conclusion of the meeting, he said the event was “indicative of the concern in the community about the council”. “The comments were representative of the feedback I get from residents and ratepayers as I travel around the shire,” he said. “Sunshine is the best disinfectant and in the interests of transparency, I’m calling on the Local Government Minister to release any report he has received from the municipal monitor. “This will inform the local community of what’s going on and help us get above the constant ‘he said/she said’ conundrum that were currently in. Chair Glenn Wright said the meeting was not being held to discuss rates, roads, windfarms, council staff or CEOs. “We need to get a positive result and see some action taken,” he told the audience. Chamber member Peter Watchorn was given the task of moving around the room with a ‘roving mic’, so speakers could be heard by the capacity audience. First to take up the opportunity was former mayor Nigel Hutchinson-Brooks, who rejected the opportunity to come back to Council as a replacement for Maxine Kiel, who alleged bullying by fellow councillors and quit because of it. Meg Edwards followed soon after, citing the same reasons. Mr Hutchinson-Brooks said he was only too aware of the kind of bullying that goes on inside Council. “I have been subject to the bullying they have been, while I was a councillor and since,” he told the audience. “I have been threatened with legal action, for which I have documentary evidence. I have been threatened with blackmail, for which I have documentary evidence, both in written form as an email and as a voicemail, which I recorded as an MP3 file. That has been reported to authorities. He backed Council’s dismissal and said “as a former mayor of this great shire it hurts me enormously to say I have to agree with this popular view, even though it may affect some good councillors”. Foster resident Matt Sherry, a United Australia Party (Clive Palmer) supporter and unsuccessful Council candidate in the last election, expressed skepticism at the motivation of quitting councillors.